Don't get too excited Jonas Brothers fans, Nick Jonas just confirmed that there is no Jo Bros reunion in the works, for now anyway. 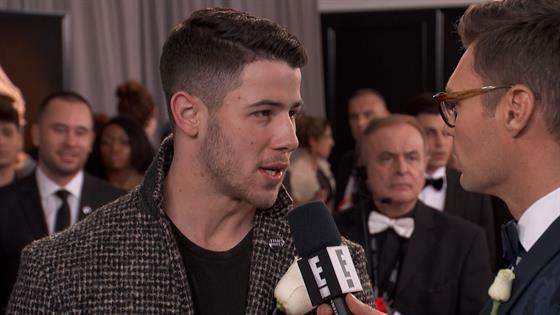 Nick stopped and chatted with Ryan Seacrest on Live From the Red Carpet at the 2018 Grammys where he dished on the reunion that had social media buzzing. "We hung out for a weekend all together then I guess our Instagram is restarted or reopened. But I can tell you there's no reunion planned, but I can never say never. You never know what's going to happen," Nick revealed. Nick's still making music though. When asked about being recognized for his work on the track "Home" from the animated film, Ferdinand, Nick said he'd love to make more music for film. "That was an amazing experience. Getting nominated for a globe was a very special moment for me. I was talking to Diane Warren about it last night at one of the parties, just the brilliance of being able to build a song specifically for a film and tell a story in addition to the story on the screen, it's really unique and I hope I get to do more of it," the Jonas brother gushed. Like many of the stars on the red carpet, Nick was sporting a white rose in support of the #TimesUp movement, an issue he called incredibly important. "As a man I think it's important to listen and to be ready to listen and to do our part where we can, when we can to raise awareness and stand in solidarity on an incredibly important issue. It's affecting so many people's lives. And if we can do our part here tonight, it's a good thing," Nick said. You can catch Nick as a presenter at the 60th Annual Grammy Awards.